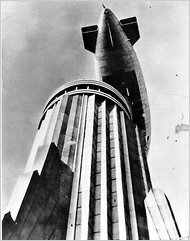 Streetscapes – The Empire State as Airship Docking Station – NYTimes.com. Tucked into a tiny space a few steps below street level, the Lipton grocery shop offered the most basic wares — eggs, butter, ham — to a community no more than a few blocks square. The provisions came from a friend of the family who farmed in Ireland and packed them onto a coastal steamship that arrived at Clydeside every Monday. Tommy, by now a teenager, wheeled a barrow to the dock, waited for the shipment to be unloaded, and then pushed it back up Crown Street. Inside the shop, he helped with cleaning and offered precocious suggestions, including the idea that eggs be served to customers by his mother, because her small hands made them seem bigger. The bustle of business captivated Tommy Lipton in ways that school never did. In highly literate Scotland, even working-class families tried to give boys a proper education, but by the time their youngest was fifteen, the Liptons concluded the three pence per week they spent for him to attend the St. Andrews Parish School wasn’t buying much. “I cannot say I was either a favorite or a diligent pupil at St. Andrews,” he later confessed. As the family’s only male child, Tommy’s potential as a wage earner was vital to his family. Soon after he left school he found work as an errand boy at a print shop and brought his pay home to his mother and father. Eager to increase his wages, Tommy moved to a job cutting patterns for Tillie and Henderson, a shirt-making company so successful that Karl Marx would eventually point to it as an example of industrial ruthlessness and gigantism. At the shirt factory, Tommy lost the independence and freedom he enjoyed as an errand boy. He felt confined and frustrated, and wound up fighting with another boy in the pattern department. This time Tommy Lipton, fully six feet tall and strong, won. Ambition drove the restless Tommy to request a raise, which was denied in writing by a manager named David Sinclair. “You are getting as much as you are worth,” he wrote, “and you are in a devil of a hurry to ask for a raise.” Sinclair wasn’t the only cranky older Scotsman who bothered young Lipton. At a night school he attended for a while he chafed under the rule of a “fish-blooded tyrant of whom Dickens would have made a character.” Nicknamed “Auld Specky” because he wore peculiar blue-tinted glasses, teacher Thomas Neil used whippings to keep order. With the likes of David Sinclair and Auld Specky making his days and nights unpleasant, ships on the Clyde seemed ever more entrancing to Tommy. When he learned that the Burns Line was looking for a cabin boy to sail between the Broomielaw (Glasgow’s riverside docks) and Belfast, he rushed to the company’s office. The job paid double what he made at the shirt factory and included meals on board. His main duty would be the care and feeding of cabin-class passengers — mostly tourists and businessmen — who boarded in the late afternoon, hoping to relax on the voyage and awake refreshed at their destination. Glaswegians found reinforcement for their dreams in the letters sent by friends and relatives who had gone before them and succeeded. Better educated than most other immigrants, Scots tended to rise once they landed in the States. They were more likely to become supervisors in factories or skilled laborers in the trades. Scots dominated the typesetting business in New York and the dry-goods business in the Midwest. And it was a son of Scottish immigrants — James Marshall — who first discovered gold at Sutter’s Mill in California. A seventeen-year-old cabin boy working on the Irish Sea had reason to hope for the opportunity to transfer to a ship bound for America and work his way across the ocean. Tommy wouldn’t get this chance. After a night crossing from Belfast, the Burns Line’s chief steward inspected the cabins and found that an oil lamp had been allowed to smoke and stain a white enamel ceiling. With plenty of poor boys eager for a job, it was easy enough to dismiss the one who was most likely responsible. Tommy was allowed to work one more week, collect his pay, and go. In his brief time with the Burns Line, eating free food and working such long hours he barely had time to spend what he earned, Tommy had managed to save a substantial sum. When his last week’s wages were added to the pot and he left the Burns Line paymaster, he went straight to nearby Union Street and the offices of the Anchor Line to ask the price of a steerage ticket to New York. For a Scottish boy entering a steamship office, the moment brought a rare opportunity. A steamer taking cargo that day was about to cast off for New York. Passage in steerage would cost five British pounds. With no requirement for a passport or visa, and American laws setting immigrant quotas still years in the future, this was all he needed to begin his pursuit of a new life in the New World. Fearing they would try to stop him, he considered simply leaving without a word to his parents. His apprehension was reasonable. Scottish mothers and fathers knew that although nearly all said they would return, very few boys who departed for America ever came back. A young man could avoid a lot of tears, threats, and demands by slipping away. After wrestling with the question, Tommy realized he didn’t have the heart to simply abandon his parents and his sickly sister, Margaret. Besides, his parents had always supported his ambitions and he had talked often of making the voyage west, to the “Land of Promise.” Surely they wouldn’t be surprised. 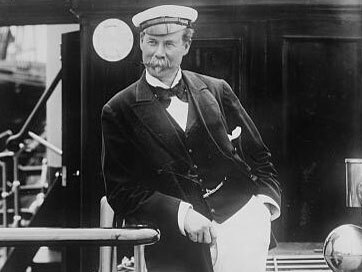 Excerpted from A Full Cup: Sir Thomas Lipton’s Extraordinary Life and His Quest for the America’s Cup by Michael D’Antonio. Copyright 2010 by Michael D’Antonio. Excerpted by permission of Riverhead Hardcover. 1934 First Electric Traction Unit Locomotive. The collaboration between Raymond Loewy and the Pennsylvania Railroad (PRR) was a fruitful one. The PRR was, for several years, the biggest railroad company in the USA, controlling, at its peak, more than 16 000 Km (10 000 miles) of rail line and employing over 250 000 workers. It has been said that the president of PRR at the time was considered more powerful than the country’s president himself. In 1934, the company built a locomotive that would become the touchstone for locomotives worldwide – the GG1, a two-way electric traction unit, that was to become a model followed by many other locomotives still in use today. Contrary to popular belief, the GG1 was not designed by Loewy. His contribution came later on, when he suggested the use of a smooth, welded construction instead of riveted assembly, in order to streamline its shape and construction. This would prove to be the begining of an amazing ride. Donovan Papers 1949: First Paper Diapers. Jordan Grant and Kelly Gannon developed a play highlighting Margaret Knight’s invention process and patent infringement case, a landmark lawsuit for women inventors. James Nelson and Erin Molloy dug into theMarion O’Brien Donovan Papers, 1949-1996, to explore her solution to the problems of cloth diapers and rubber baby pants common to the 1940s. Although she lived generations later than Margaret Knight, Donovan encountered plenty of similarly gender-based stereotypes; women didn’t do science and technology. Donovan became her own best marketer, and her “Boater” diaper flew off department-store shelves. Both Donovan and Knight became prolific inventors in their time.